After several dry months, the Bay Area might get some rainfall this week. That would be the first precipitation for San Francisco in four months. On Saturday, light showers fell on Sonoma and Marin counties while San Mateo and Santa Clara counties saw some drizzle . October is when the region typically starts transitioning to wetter weather. But the risk of wildfire remains high, according to fire experts. "We're not letting our guard down," says Cal Fire Deputy Chief Scott McLean. "It's looking great now as far as weather, but (the weather) is starting to wane in terms of rainfall." September and October are historically the worst months for wildfires, according to Mclean, with seven of the state's 10 worst fires having occurred in October. "A little bit of rainfall is not going to make much of a difference because everything is just so dry," McLean said. "It's going to take several years of winters to bring California to that plateau where plant life is not as dry." The Bay Area is listed as “abnormally dry” by the federal government. The cooling trend the region is currently seeing will be replaced by warmer temperatures later this week. 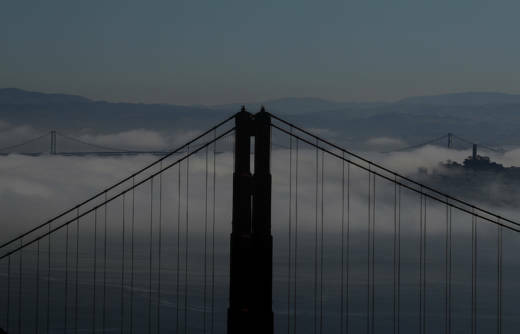 The Bay Area has had seasonably warm weather lately, with temperatures in the 80s and 90s. October and November are typically when the Bay Area begins to experience cooler weather.